Based on his popular Instagram feed @Manny_the_Frenchie and Facebook profile, this is an illustrated and humorous guide to living a happy and fulfilling life by “the most famous French bulldog in the world…who’s downright amazing” (Buzzfeed.com). In 2011, Manny was the runt of the litter and on his way to a shelter. But when his parents scooped him up, named him after the world famous boxer, Manny Pacquiao, and began posting photos of him sleeping in their sink accompanied by humorous, optimistic captions, Manny went viral. Whether he’s wearing sunglasses, hitting up music festivals, or sleeping in adorable costumes, this little Frenchie always encourages a positive, do-gooder outlook to his followers. 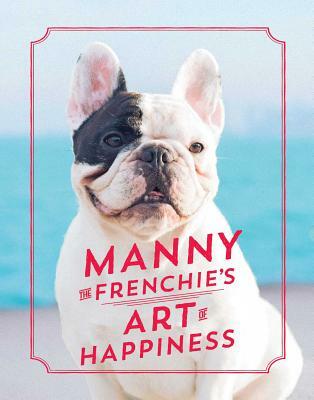 Packed with cheeky humor, witty wisdom, and charming anecdotes, Manny the Frenchie’s Art of Happiness will satisfy dog lovers of all breeds. "Full of tips on how to reach Manny-levels of happiness and includes oodles of adorable photos to help you get there."